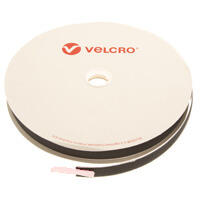 Self adhesive VELCRO® Brand commercial hook and loop tapes are supplied on 25m rolls with various types of adhesives pre applied to the back. Commercially rolls are supplied as hook or loop, so if both sides are required you would need to buy two rolls. We keep stock of a wide range of adhesives, the bottom of this page has a chart that indicates what type of adhesive would best suit your application. PS14 Self Adhesive Sticky Backed VELCRO® Brand Hook & Loop Tape in 25m Rolls. 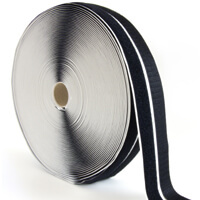 PS18 Acrylic Self Adhesive VELCRO® Brand Hook & Loop Tape in 25m Rolls. PS18 Flame Retardant Self Adhesive VELCRO® Brand Tape in 25m Rolls. PS30 High Tack Self Adhesive Rubber Block Copolymer VELCRO® Brand Rolls. 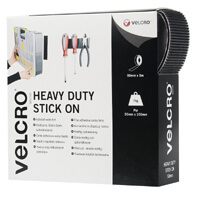 Heavy Duty Stick On PS51 and PS52 Tapes with Plastic Hooks and Ultra Strong Adhesive. 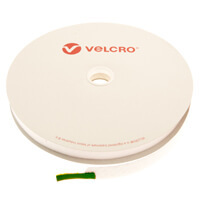 TEXACRO® Self Adhesive is Manufactured by Velcro Companies and is a Low Cycle Dispaly Tape. 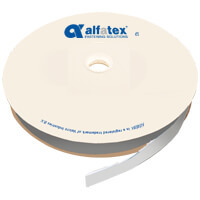 Alfatex® Standard Rubber Self Adhesive Rolls Available to Order in a Range of Colours. A Selection of Self Adhesive Tape in Handy 5 Metre Consumer Packs from 10mm to 25mm Wide. PS14 (Standard Adhesive) This is a rubber resin suitable for most general purpose applications, will adhere to most surfaces with the exception of PVC and any plastics containing plasticizers. PS14 is a low tack adhesive, ideal for use on metal, glass, wood, rigid plastics and card. PS51 and PS52 (Heavy Duty) This is again a rubber based resin, but is extremely strong, the high tack ensures instant and permanent grab, perfect for use both inside and out as it has weather resistance. Will adhere to metal, glass, wood, rigid plastics and card, use on PVC and plastics containing plasticizers is advised with reservation. PS18 (Acrylic) this is a high tack water based adhesive, it offers the best solution when sticking to PVC and plastics with plasticizers. PS18 also adheres well to Foamex so is good for use in exhibitions; the resin also offers good heat resistance when compared to other adhesives. PS18 is not recommended for use on Polyethylene or Polypropylene.